It was Jason’s first guitar almost 20 years ago, the one he learned to play on. It was a red burst color back then. The mid-60s Sekova guitar (like this one) originally belonged to his mom, believe it or not! His dad taught him as many chords as he knew and then Jason started weekly guitar lessons. He’s been obsessed with all things guitar ever since. By the time Jason was a guitar performance major in music school, he was the one teaching guitar lessons. He’s had a lot of different guitars through the years, always buying, selling and trading up. In a high school art class Jason painted the old Sekova blue but never reassembled it into working order. 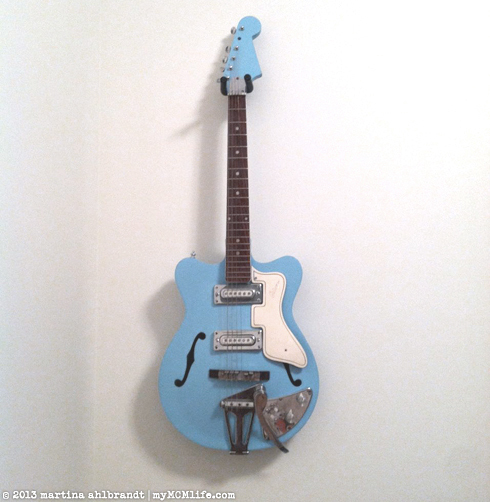 I’ve always treasured the blue guitar but it took a lot of convincing before my guitar loving husband would allow me to display a non-functional guitar in our house. To me, the blue guitar represents dreams that come true—if you pour your whole heart into something, work hard and never give up, you CAN reach your loftiest goals! Jason has a tender heart, an inherited work ethic and perfectionism (I blame his German roots), and a rare tenacity. He’s now playing professionally, traveling the world, making a good living doing what he loves. 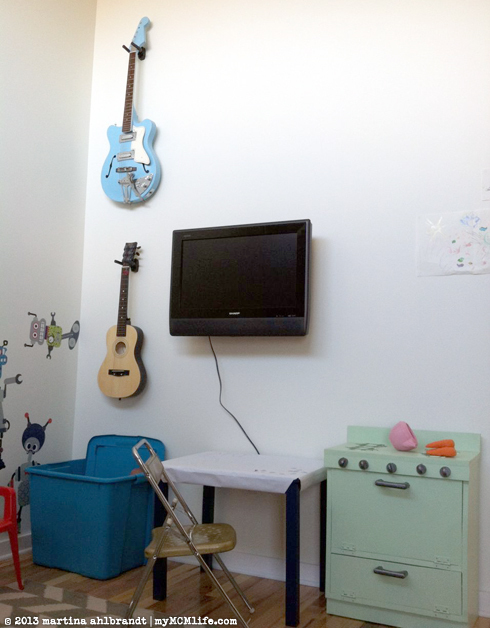 I hung the blue guitar in the playroom where our kids spend a lot of time because I want them to ask about it. I want to tell them over and over again about how hard their daddy worked and how much he loves what he does; I want them to know—to really know—that with enough passion and diligence they can achieve whatever they desire to achieve. Dreams do come true. 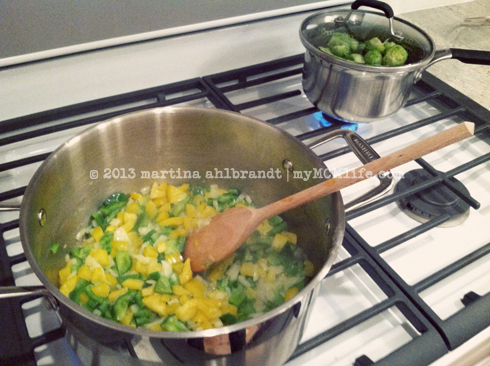 One of my goals for the new year, now that we’re in our new home, is to cook more. I’ve never been too much into cooking and really slacked off a lot while we were living with my parents. My mom was kind enough to let us chip in for groceries and still do a lot of the cooking she would be doing anyway—except for 5 people instead of 2. (Thanks, Mom!!) Part of what has held me back from cooking more in past years is the time to plan and shop for meals. Jason (who is a very good and creative cook!) and I would walk through the grocery store together and look for inspiration based on what was on sale. That would usually get us a meal or two and a lot of random stuff. There was a Groupon for eMeals around New Years and after discussing with a friend who as used it before, I decided that this would be my plan for 2013. So far, I am completely loving it…so much so that I’m writing this blog post! 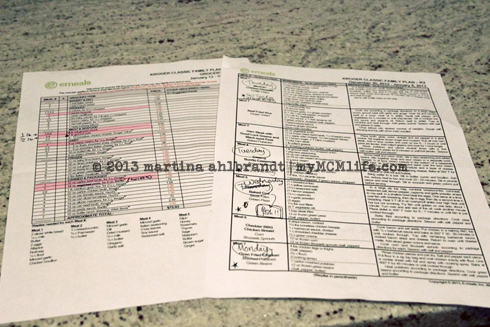 Every Sunday I get a 2 page PDF in my inbox with 7 recipes and a grocery shopping list for my neighborhood Kroger. The recipes are selected based on what’s on sale this week. It takes a huge amount of the planning out it and allows me to get great deals without flipping through ads, cutting coupons or wandering through the store. (Ain’t nobody got time for that!) I love that the shopping list is broken down by section of the store, too. It’s cut grocery shopping time down by half. At least. It’s also saving us money. The plan we’ve selected is the Classic Family Plan (the only one based on your local grocery store’s sales, I think) for 3-6 people. 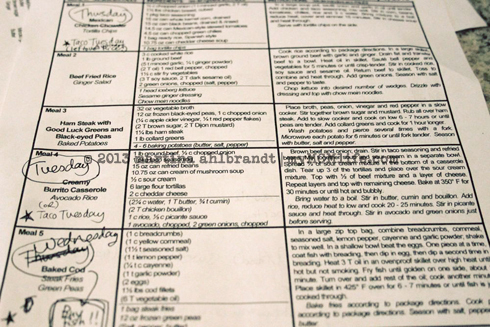 They also have an option for 1-2 people but my friend suggested the bigger plan because it yeilds a lot of leftovers. That’s where the second half of the time and money saving comes in for me. Often, I’m able to freeze half of the meal either cooked, or partially cooked following the freezing techniques of Don’t Panic—Dinner’s in the Freezer We also have leftovers flowing all the time so I very rarely need to eat out for lunch or take my former staple can of soup to work. 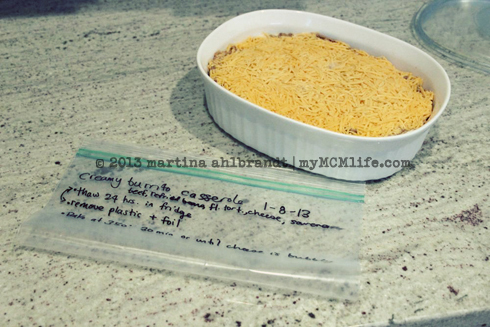 This is Creamy Burrito Casserole round 2 – just after taking it out of the freezer to thaw. The recipe made enough for 2 good size casseroles. An unexpected result is that we’ve been eating out less. I never really thought we ate out all that much but having a plan for the week means that we’re very rarely going out to eat Monday-Thursday. We usually treat ourselves to a night out after work on Friday and a lunch after church on Sundays. Other than that, we’ve been spending around $40-45/week on dinner/lunch. That does not include things like milk, eggs, cheese, yogurt, fruit and other staples but for the bulk of our meals…I think that’s pretty good. 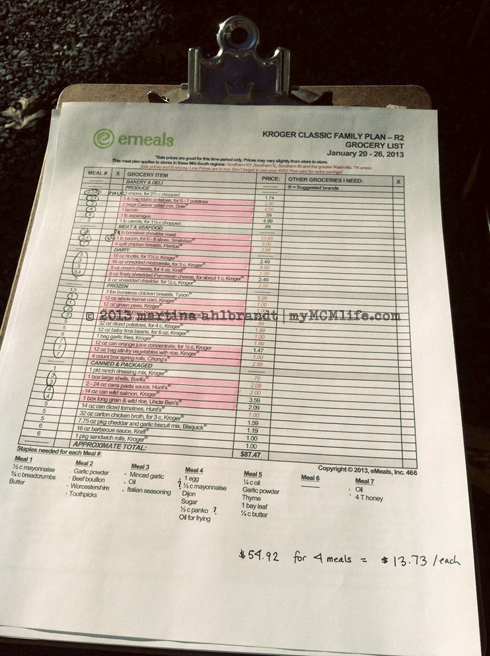 The plan adds up to around $85 for 7 meals for 3-6 people. I’ve been choosing 3 meals per week and selecting from a rotation of freezer meals for the other days we’re eating at home. Another, perhaps more obvious benefit, is that it’s introducing us to a lot of new recipes and new foods. 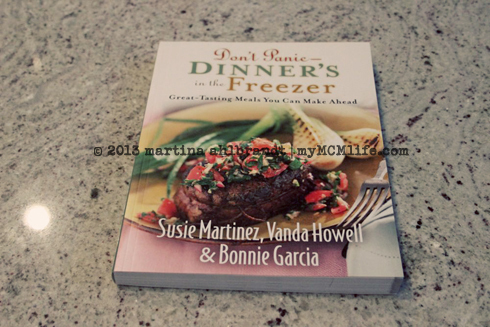 All the recipes we’ve tried have been good, some have been excellent (salmon cakes, swedish meatballs, oven fried chicken, creamy burrito casserole). I’ve discovered some items in the grocery store that I never knew existed (panko, cheese soup). I’ve learned where I/we draw the line to save a buck…white bread sandwich rolls for $1? Head of iceberg lettuce for $1.49? No thank you. I’m willing to pay a little more for something we like better. Some of our goals are on a personal level, some are career related, some are for our family and home, some financial, and some are big picture goals. We didn’t hit all of our goals for 2011 and that’s OK. We set a lofty income target and we didn’t quite make it, but we did see a significant leap. We’ll try for that goal again in 2012. We had goals to finish some home projects like put a shade roof on the pergola and build a privacy fence around the patio and garden, which were completed. Others, like replace the plumbing mainline to the street, we decided to forego. We had written a goal to start saving for our next vehicle. We ended up buying the Silver Bullet in cash. Yay! We had planned to save up money for an adoption or for medical expenses if we had a baby. We ended up draining all of that money preparing our home to become foster parents. That works, too! We had intended to save, save, save for our future (kids, vehicle, retirement) in 2011 but we ended up just saving a little (see above two points). My favorite goal of 2011 was “Take more risks.” At the time, that was a big picture goal. We didn’t have anything specific in mind when the calendar page flipped over to 2011. Turns out we became foster parents, which was a pretty huge risk. We also bought a piece of land and put our beloved MCM ranch on the market with plans to build our dream house in 2012 with rooms for more kids. It’s fun to look back at how much life has changed in one year. 2011 was a challenging, stretching, overall good year. On December 30th, Jason and I were driving to Branson for a weekend getaway. (Actually, J was working: playing for Guy Penrod; but to me, it was a mini vacation!) Eight hours in the car gave us plenty of time to reflect on 2010, our goals met and unmet; and to dream and plan for 2011. Instead of starting out with a list of home projects like last year, we decided to start with a list of financial goals. In 2010 we filtered most of our nonessential income toward home projects and saved what we could. In 2011, we plan to filter a lot of our nonessential income into savings and investments, and keep a lower, specific amount set aside each month for home projects and repairs. Our financial goals include a target annual income, retirement savings milestones, general savings targets, getting both of our old cars in good working condition and saving a certain amount toward new replacements and saving for a vacation. What about you? Do you make goals for the year? Resolutions? Do you write them down or just make 1 or 2 decisions that are easy to remember? I’m curious to hear what others do. If you have any great ideas or special goals/resolutions, please share! We’re 4 days into the new year and many people have already made resolutions … and some may have already broken their self-vows. A few years ago Jason and I heard about a successful couple from our neighborhood who write out their goals and a gameplan together every year, rather than New Years Resolutions. – finish master bathroom renovation – check! – get new tires for our car – check! – fix car windows that won’t stay up – check! 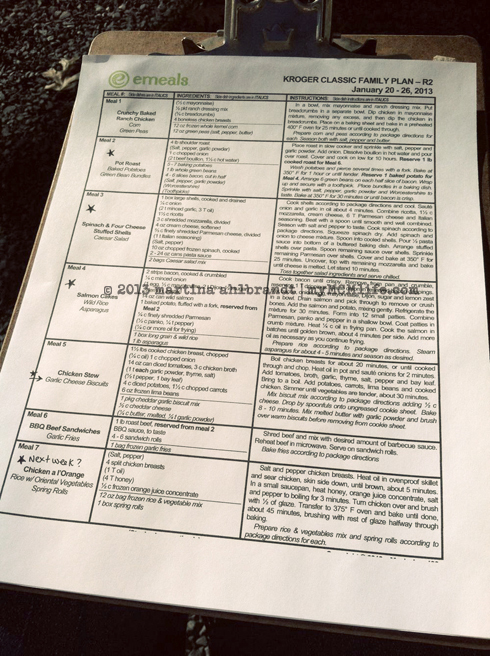 A second list included 2010 financial goals. We listed 4 areas and target amounts we wanted to save for each purpose. We hit 2 of the goals and came halfway to the other 2 goals. I also made some goals for myself in four personal areas: home, career, family and spiritual. My goals included things like rework my home office, expand the number of designs in my Etsy shop, help more with the gardening and composting more, and stop obsessively planning (AKA worrying). We’re really pleased how things have turned out this past year, both in terms of meeting goals and in unexpected, unplanned blessings. It has not been an easy year for many people and I know a lot of our Nashville friends are more than ready to forget 2010. I love the start of a new year and the excitement and potential of a fresh start! Last weekend while Jason and I were driving to Branson, Missouri for New Years (where he was playing), we wrote our goals for 2011. I’ll tell you about them tomorrow.